Since my last post, the nominees for this year’s Agatha Awards have been announced and EQMM wishes to congratulate all of the nominees in the short story category, but especially regular EQMM contributors Dana Cameron and Art Taylor. Dana earned her nomination for her November 2012 EQMM story “Mischief in Mesopotamia” and Art received his for “When Duty Calls,” from the anthology Chesapeake Crimes: This Job Is Murder. Other nominees include “Thea’s First Husand” by AHMM author B.K. Stevens. Altogether, it’s an impressive lineup, and the Cameron and Stevens stories are now available for reading online at our website. The Agatha Awards are a highlight of one of our genre’s most important fan events, the Malice Domestic Convention, held each year near Washington, D. C.
Of all the mystery conventions I’ve attended, this is the one at which members most openly express their love for the great authors the field has produced and for their fictional creations. And I use the word “love” here advisedly. The first time I attended a Malice Convention fancy-dress tea and saw dozens of fans not only in period costume (some inspired by mystery’s iconic sleuths) but in outlandish hats (which I soon learned were to be judged for a prize), I confess that I thought it all really over the top. But I had the seriousness then of someone not long out of the academic world, where writers with devoted followings inspire “societies” not “fan” clubs or conventions, the former word somehow suggesting an intellectual basis for the association. It was a revelation to me that so many readers would find it natural to express their passion for a writer’s work through exaggerated display, rather than by means of a journal article or discussion group. But it was all a lot more fun than plodding through scholarly analyses. And these people knew their stuff as well as any academic lecturing in the then newly forming curricula of popular fiction. In the course of my editorship at EQMM, I’ve met many die-hard fans of mystery’s various authors, characters, and forms. I’ve observed many ways of paying homage, from the writing of pastiches to the creation of special Web sites to collecting or dramatizing an author’s work, to engaging in the kind of game familiar to most Sherlockians of offering theories to fill in gaps in the lives of fictional characters. For me, one of the most memorable events of my time at EQMM is the 2005 Ellery Queen Centenary Symposium, held at Columbia University, where, thirty-four years after the publication of the last Queen novel, fans gathered to celebrate two men whose writings under that byline were still a vital part of their lives. 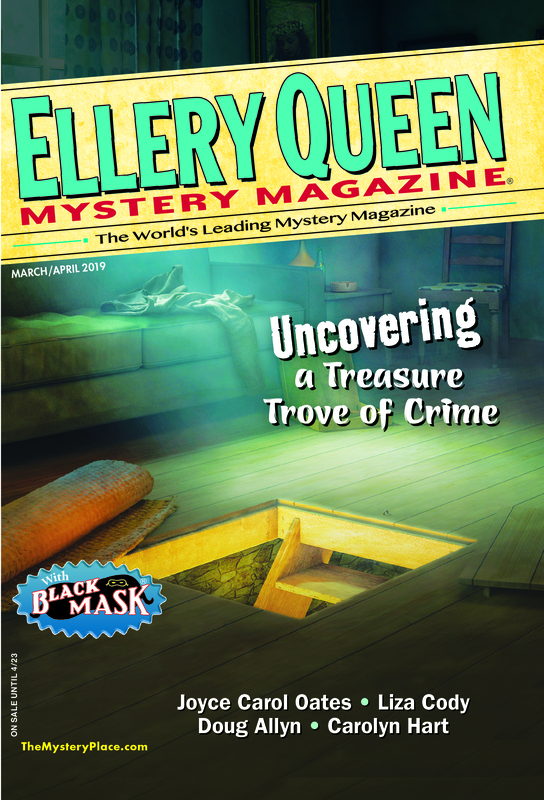 That day’s most surprising visitor, because of the distance he traveled, was Belgium’s Kurt Sercu, founder of the world’s largest Ellery Queen site, Ellery Queen: A Website on Deduction. Regular EQMM readers already know the story of how that symposium turned out for Kurt and the friend he met there in person for the first time, Dale Andrews. On a train taking them from the symposium to Washington, D.C., the two of them, both previously unpublished in fiction, plotted out an Ellery Queen pastiche that subsequently appeared in EQMM. Dale posted an article about pastiche writing and its significance on this site on June 13, 2012. I will leave you to read Dale’s own account of the form’s relationship to fandom, saying only that his conclusion that the pastiche writer—the ultimate fan—is “in love” hits on a truth that most of us can recognize as applicable to our own experiences as readers, at least in some form. Extreme, and even bizarre, as this case is, it brings out the essentially selfless nature of most fandom—which is, I think, why the report in an English newspaper a couple of years ago of an Agatha Christie fan’s discovery of Agatha Christie’s mother’s lost jewels in a battered old chest she bought at auction for a hundred pounds struck a chord with so many people. The locked chest was purchased entirely for its connection to Christie and sat in the Christie fan’s house for several years as a subject for conversation, until she decided to have the locks forced and discovered a strongbox inside with jewelry said to be worth possibly a hundred thousand pounds. That collector appears to have received an astonishing return on an investment made solely out of admiration, but most fans, of course, get only the return of a sense of connection with the object of their veneration. And there sometimes seems to be no length to which a true fan will not go to experience such a connection. At a gathering of Sherlockians in Toronto a few years ago, a séance to conjure Conan Doyle was included in the slate of activities. But given that Doyle is known to have had connections to the spiritualist movement of his day, that may not be so different from Chandler fans drinking gimlets on their idol’s birthday. And since we’ve finally brought a hardboiled writer into this conversation, it should be pointed out that however gritty and true-to-life that area of our genre is claimed to be, its followers are not above a little dressing up for the sake of tribute either. It has been reported, for example, that the guide of San Francisco’s well-known Hammett tour dons a trench coat to set the mood. Certain of these examples may only serve as proof to some people that genre fandom exists at the fringes of the mainstream. After all, isn’t it abnormal to be so absorbed in fictional creations, or to celebrate their creators in such obsessive ways? I’ve come to think not. If there are extremes in fandom, they are usually not unhealthy extremes. And are there any avid fiction readers out there who haven’t at some time or other come across an author whose work spoke to them, or lifted them out of the commonplace, in a way that seemed to demand further reading? I think we’ve all had the experience of coming across a book that inspires us to search out everything else its author has written. I was giving blood once when I noticed on the table beside the nurse who was drawing it a series romance novel—the kind with a formulaic plot and characters devised by the publisher. Somehow we got talking about it, and it turned out the woman was an insatiable reader of these books; they were, she said, the chief pleasure in her life—the thing that had gotten her through a lot of grief and loss within her family. I have reflected since that she was very fortunate to find the kind of books that could take her to a happier place, if only in imagination. And I never again looked down my nose at a “formulaic” romance. This entry was posted in Books, Characters, Conventions, Fiction, History and tagged characters, fandom, fans, literary, literature, Malice Domestic, mystery, noir, publishing. Bookmark the permalink.